LET'S CELEBRATE WORLD BOOK DAY 2016 with 'The Boy Who Could Do What He Liked', written and recorded by the author David Baddiel, especially for World Book Day on March 3rd 2016. 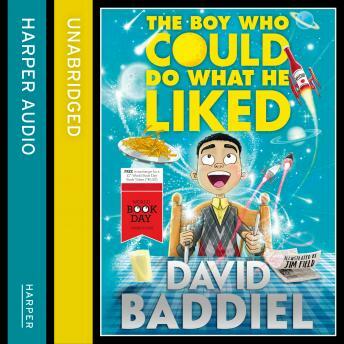 LET'S CELEBRATE WORLD BOOK DAY with 'The Boy Who Could Do What He Liked', written and recorded by the author David Baddiel, especially for World Book Day on March 3rd 2016. This is the first audiobook to be produced for World Book Day - it's a hugely entertaining and touching story of a boy called Alfie who likes to keep to strict routines and schedules. It's all rules, rules and more rules in Alfie's life. When a new babysitter arrives called Mrs Stokes to look after Alfie he begins to realise that rules aren't everything and perhaps the mysterious Mrs Stokes is no ordinary baby sitter! Includes wonderful music and sound effects - a jam packed listen with plenty of laughs along the way. Does everything get hilariously out of control? Yes.